We often wonder how tall our celebrities are. Do You? We found this great website where you can check the height of your favorite petite celebrity or any celebrity of any height. When you are on the page, from the top right pick the letter that your celebrity is under and just find her or him in the list. The height is shown next to the name and it is in feet (imperial). If you are metric friendly you can always convert it into centimeters by using this conversion tool. Paula Abdul, 5'0" is a famous petite dancer, choreographer, actress. 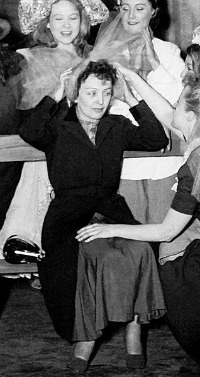 Famous petite women are not only in the film indusrty. 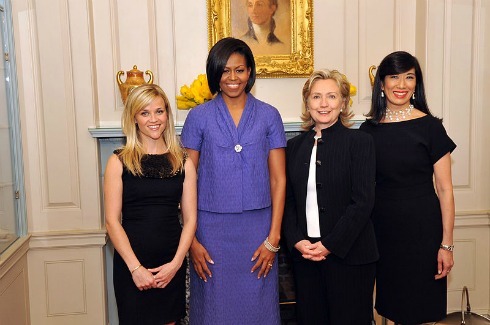 There are many petite females doing really well in politics all over the world. 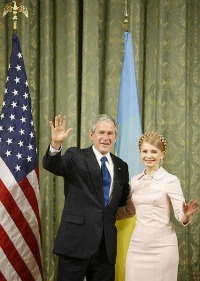 Yulia Timoshenko, in the picture with the former US President George Bush, is the former Prime-Minister of Ukraine. Mother Teresa was a petite woman with a huge heart. She was a great support to poor and helpless, helping them in her own ways. Rosa Parks, civil rights activist, was also a short woman. According to some sources, Edith Piaf a legendary petite singer was only 4'8". So is her "successor" Mireille Mathieu. There are many famous modern singers under 5'4", "legally petite", Kylie Minogue, Lady Gaga, Madonna, Shakira and many more. When some celebrities are on TV, you wouldn't think they are small. It's amazing what they can do nowadays. Depending on which angle, the cameraman is shooting and the color shades or objects around the star, they can make the person look taller or smaller. There is so much happening daily in celebrities lives. So if you would like to be on top of any news about them, we want to share with you these latest news fed by Google. How Short Is Your Petite Celebrity? Is Your favorite celebrity Petite? What's her name, height, dress style? Have her photos? Share all! We are dying to know who she is.